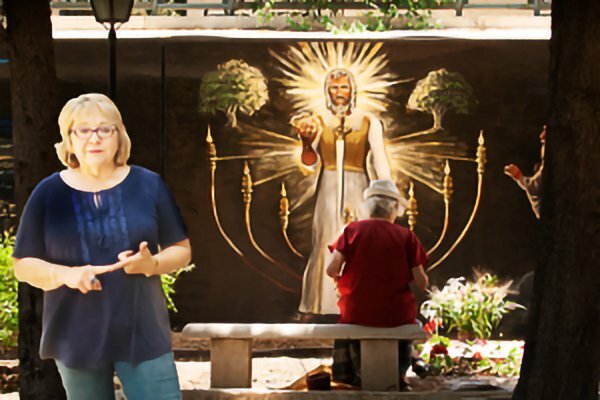 The Alliance Church International Cemetery in Jerusalem’s German Colony is home to the recently completed Wall of Life, a mural now gracing its old, once dour walls with beautifully rendered scenes from Genesis to Revelation. Attracting visitors in growing numbers from all over the world, the finished mural is four hundred feet long, the unlikely product of decades of visions, providence, prayer, hard work and, most of all, love. The unique work’s advent was not uneventful. Even now, after clearing numerous spiritual and physical hurdles to its completion, its survival is threatened. But we’ll begin at the beginning. The complex chain of events that led to the prodigious artistic accomplishment began in the late nineties when its principal creator, artist Patricia Ann Solveson, was a young and seemingly lost soul living in southern Wisconsin with no connection to Israel.